The Briger Laienhistoriker (Laymen Historian) states in a thesis that the name Tell is identical with the family name Tehler from Ausserberg and with detailed reasons, tries to prove it. Heldner Paul: Do the Tells ancestors originate from Wallis. It is generally well known that the Urserntal is a Walser Colony and that it was colonised from Goms around the turn of the 12th century. Paul Zinsli explains in his book about the Walser Volkstum (page 27 ff) why. The Schoellenenschluct was not yet opened and therefore Uri could not be settled from Ursental. The population surplus in Uri grew, as in the whole of Urschweiz (Ancient Switzerland) at the beginning of the 11th century, and therefore had to migrate, namely to Unterwalden and from there over Brünig and Grimsel into Wallis. This also became over-populated, first and obviously the Ursental and then further colonies were developed mainly in Graubünden. It is less well known that the whole of Schächental is a Walser colony. The Walliser Saint Theodul serves as a good indicator and it is after him that the Church of Unterschächen is ordained. When this church was reconditioned some years ago, several paintings representing Theoduls legend were found in the vaults. These paintings also served as memories for every valley resident that they once had indeed immigrated from Wallis. This colonisation must have taken place some time before 1290, since in this year the valley population had become so large that they established a parish church in Spiringen due to the separation from Bürgeln. A document, important for the Walserforschung, from the 29th March 1290 contains the names of all residents in Schächentales who may have donated something to the church of Spiringen. Among them are several names that are easily recognizable as Walliser: Walter in der Matte we find in Oestlich-Raron; Walter im Hof – is also im Goms; Walter Murmann - in old Bezirk (district) Naters already mentioned around 1250 ; Konrad in Oberdorf - in Goms; Walter Gruober - in Nikolai- and Lötschental; Walter Schmid - in Ausserberg; Konrad Fürsto - in Naters Comitis, this is also known as Fürst and Grafen; Peter der Obroste - in Gantertal; Burkard am Zusse - in Gamsen; Konrad von Telgingen – probably vom Thel von Ausserberg; Rudolf Burger - probably Burgener von Törbel; Walter ze Brunnen - in Ernen and Etscholl; Walter von Spiringen , probably originated from Spichting then accompanied to the Bezirk (district) Naters. What is even clearer is that the Walliser place names seem to have been kept. For instance: Buolacker, Ebnöde, zem Kere, ze Obfluo, Buzzen (today Bitzen), Balmostein, nid dem Wege, an der Halten, Louwi, an Stuckt, uf der Halden, uf der Schwanda, ennunt der Egge, ze Brunnen, an der Halden, Rössen, Suelbes Egg (Schelbenegg) unter der Furun, zen Stocken, Langenacher (Lengacher) Ebnöde, Bizzinges (in Unterbäch) Rüti, Gadenstatt, ze Rotenbohl, zem wissen Stein, Melbaumers Acker, ze Müllbach etc. Of course, not all of these family and place names, which have been in Oberwallis since 1290, have been imported from Wallis, but nevertheless this gives us a clear indication of where the immigrants came from, namely Goms and partly from the area between Naters and Roron. From this area we know that sometime after the year 1200 the two groups of Höchstalemannengruppen Ost, who had come over Gemmi and Lötsehen, collided with one another here and were forced to emigrate. The Schächen – as in Isental at that time was seen by the Urnern as too wild and therefore not colonised, as is easily proven by the Urbar (arable) from the monastery in Zurich. In Buche, the start of the Swiss Confederation had Oechsli provide a map with the Grundherrenrechten der Waldstätte (Land rights of ownership). While the whole of Reusstal is in the possession of the Frauenklosters (Nunnery) in Zurich, we see that the whole of Schächental is free hold land ie: it was not settled by the Urnen, instead as already alluded too, it belonged to the Kloster (Monastery) from Zurich. It is different with Isental, which belonged to the Monastery Seedorf. The monastery was established around 1243 by the Baron Arnold von Brienz. What is known in this case is that while the Baron von Raron was related to that from Brienz, which is closer, than that from Bishop Heinrich von Raron, his relations from his Herrschaftsbereich (area of rule) dem Bischofsberg (Ausserberg) settled in Isental. This Bishop, in 1243 (Thus the same year as the donation of the Monastery Seedorf) sat upon the Bishops chair in the diocesan of Sitten. Beside other families immigrating from the Orte Thel above Ausserberg, the families in Thel (Today its called Theler) immigrated to Seedorf, whereby the Ortsnamen (Village name) Teilmatte is proven to be established around 1300. It is worth noting that in Isental the holy Theodul was also honoured. Their descendents moved to Bürglen, where our National hero Wilhelm Tell with his wife, born in Fürst from Schächental (Also a Walser) had lived. Long before the year 1300 that name in Wallis can be proven, with the support of documentation, however in the Latin form for Theodor de Tella, Christian de Tella and Peter of the deceased Aymo de Tella in the area between Naters and Raron. However, the origin of this name lies in the Orte «im Thel» near der Alpe Rafft above Ausserberg, where here the ruins of the former Hofstätten are well preserved. The ancestors of our national hero therefore originate from dem Thel in Wallis, it is understandable, that one had searched for them in vain in Uri and finally discovered their existence in the Reich der Sagen, only due to the fact that man had searched everywhere except in the right place. After I sought, in the last article, to prove that the ancestors of Tell originated from Wallis, to be more exact came from the Orte «im Theel» (high above Ausserberg), it is not erroneous, to expand with a few words about this place of origin. Due to the lack of available pasture it was necessary (with a population surplus) around the end of the 10th century for farmers to emigrate from the Berner Oberland, over Gemmi and the Lötschenpass, with their cattle into Wallis and firstly settle in Leukerbad and Lötschental which at that time was hardly used by the Franko province population. Thus, Leukerbad was called «Boez» at that time, which (in the old French language) meant nothing more than bushes (Boscet). There were no Matten (meadows) or Aecker (Fields), rather more bushes and wasteland, so much so that this high country was left alone and probably only used as pastureland (Alpweiden). The new settlers however, established themselves here further down over a year, colonised it, and the population surplus grew further and started to populate the surrounding mountain slopes, being Laden, Tatz, Jeitzinen, Theel and Raaft. However, in a period of more than 200 years almost the whole of «alemannische» Wallis was alemannisiert, the surplus had to emigrate elsewhere since there was no more space in Wallis. This is how after the year 1200, actually more exact would be 1250, there were established Walser colonies in Upper Italy, in Tessin, in Uri and of special interest to us in Graubünden, Vorarlberg and elsewhere. Around 1250 to 1300 we find that within the borders of the Gemeinde Leukron the three Orte (places): Leiggern, Theel and Raaft have the following families resident: Zenhäusern, Zehnder, In der Binnen, Am Acker, Schmid, Buschin, Troler, Wala, Tufetscher, Muracker, In den Bodmen, Im Baumgarten, Langen, Leiggener, Raafter and naturally a Peter and a Johann zer Teelun, hta today uses the name Theler. If we examine the first names of all these families then we see that the most frequently used names besides Wilhelm (the same as our national hero) seem to be Johann and Peter. Thus, we find a Wilhelm of the deceased Anselm in Casali und a Wilhelm des Bartholomäus in Casali von Leiggern. A Wilhelm of the deceased Wilhelm Dezimatoris, a Peter des Wilhelm am Acker and another Wilhelm am Acker with three sons, a Wilhelm in den Bodmen and a Wilhelm in domo lapidea. If we examine this connection to different areas of Oberwallis, then we come to the same conclusion, which is naturally not conclusive proof but nevertheless, an indication of the origin of a first name from Wallis. Pfarrer (Minister) Anton von Roten found that the name Wilhelm in Saas-Balen was the second most used name behind Johann for this time. Professor G.Wirz wrote that when searching for the Gattin (wife) Stauffachers, Verena zer Frauen and Tell, that the first name Wilhelm was regarded as a typical «Walsername». However, what was not yet known at that time was the fact that Schächental was a closed Walser Colony, which was developed shortly after 1250. It is, nevertheless, well known that the family zer Frauen came from Wallis. (See the old Walliser Wappenbuch p.99) When we examine all the writings and documents of Uri, whilst excluding the Walser colonies of Unsern-, Göschenen-, Schächen- and Isentals, we search in vain for the first name Wilhelm, a statement, that it was abused by some as an attempt to prove that there never was and never had been «Wilhelm Tell» in the Urnerlande. Therefore I state the following. The first name Wilhelm was obviously not common in the Urnerland and therefore when it emerges once or twice then we are obliged to think of an import from the homeland for this name, namely Wallis. Even if this name is not located in any document, it is no conclusive proof as to the non-existence of this man. He therefore, provoked Gessler intentionally, because he knew, due to his participation in the secret conspiracy on the Rütli, that this Tyrant would soon be driven out. Did the Walser families Fürst und Tell participate in Rütlischwur? After Werner Stauffachers, the son of Landammans Rudolf, had had his memorable meeting with Zwingherr Gessler von Meyenberg in the year 1306, before his stone house by Steinen «steinernen Hause», (whose foundations walls are still present today) and on the advice of his intelligent wife, after Attinghausen, moved to his relatives, the family Fürst and zer Frauen (present day Freuler); it is safe to say that this relationship is due to his wife; this means that she was a Fürst or more logically, zer Frauen, because her name is politely referred in the second place. Since the ancestors of both families originate from Schächental, we are obliged to look for the co-founder and her ancestors in Schächental. Professor Wirz from Bern found her, in the form of Verena Stauffacher, originally born zer Frauen, and lived in Spilmatte by Spiringen, whereby from the 10th century up to the 16th century can be discovered. Stein des Anstosses between Stauffacher and Gessler built the beautiful stone house, in spite of this being forbidden by the emperor. This Burgenmonopol, issued in 1279 by the Emperor Rudolf v. Habsburg reads: «Keine Person, welchen Standes sie immer sei, darf im Gebiet einer Grafschaft eine Burg oder irgendein «festes Haus» ohne Zustimmung des Grafen erbauen.» (In short, no one was allowed to build a stone house without first obtaining consent.) Intentionally he built a firm house without the agreement of the Grafen v Habsburg to demonstrate that the Schwyzer were not subjects of the Habsburger, but realm-free people. Stauffacher probably knew and had probable cause to fear that his house would be torn down, thus reason enough to do everything in his power to forestall this from happening. If there existed a relationship through marriage between the family Stauffacher and zer Frauen, there must have also existed another between Stauffacher and Fürst. In Rütli they met, before they met secretly here, in order to harvest hay for feed that was always scarce in winter. They cleared the forest to alpine meadows (reuteten also den Wald) so that more hay could be gathered, and therefore this place was called Rüti, and later Rütli. The extra hay was not used as feed here, rather it was kept in a Scheune (barn) and if necessary it was picked up by ship. 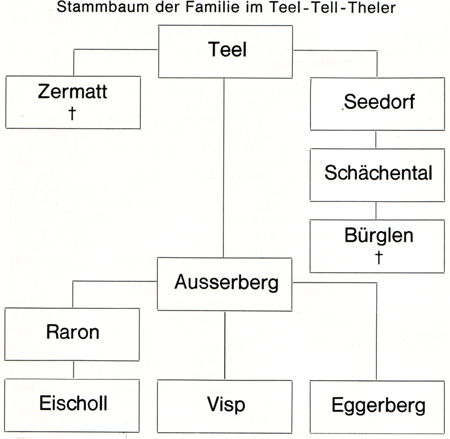 The relationship between Wilhelm Tell and Walter Fürst, Tell married a daughter of Fürst and named his oldest son Walter, his boy was named Wilhelm, can also be found in the Jahrzeitbuch from Spiringen together with Uka Fürstin, probably his mother. In the Klingenberg chronicle it states that Tell would have had two sons, Walter and Wilhelm and that together with his father-in-law Walter Fürst, they all took part in the battle of Mortgarten in 1315. This clear and correct text was, if at all admitted, declared to be a mistake or a falsification. Some «Geschichtsschreiber» (Historians) make easy light of this. When one can find Uka Fürstin in the Jahrzeitbuch at the same time as Walter Tell then some sort of relationship must have existed, apart from the fact that Tell together with Fürst and Stauffacher had sworn to the secret federation on Rütli. Stauffacher was a wise and outstanding man, because he was the son of des Landammans and had an intelligent wife, who originated from Schächental and therefore was originally from Wallis. His wife felt his concern and advised him: «Du hast doch in Uri Vertraute, aus dem Geschlecht der Fürst und aus dem der zer Frauen, die denselben Kummer haben». He went to Uri, until he had found someone who was troubled by the same grief. However, he met a man from Unterwalden, who was the servant who had cut the finger of Zwingherr Landenberg in two, who was always on the run and whose life wasn’t safe anywhere. This depressed him, that because of him his father was blinded and it was decided to seek vengeance. After a century of clearing different Thälen (valleys) (Thelen-Föhren) a small settlement was formed «im Teel». These settlers carried no family name but as soon as they left this place, they were referred to as zer Thelen. This settlement and the family name can be proven in documentation from 1250. In the 13th century a branch of the family «zer Teelun» can be established in Zermatt which later died out. In the same century there must have been a branch of this family close to Seedorf, since the neighbouring family, mentioned in Steinhaus, came from Leiggern close to im Theel, the alpine meadow from the family zer Tellun, thus possessed the Tellunmatte. Towards the end of the 13th century in Orte Telgingen, above Spiringen in Schächental, one can find the family zer Telen that in turn, had given Orte Tel-gingen its name. Since one cannot find any Thelen here means that the family name must have immigrated with them, thus from Seedorf, as around this time, 1300, no family zer Telen is recorded in Seedorf. Briefly after 1300 a branch of this family resided in Bürgeln and called themselves «Tell», they later died out. 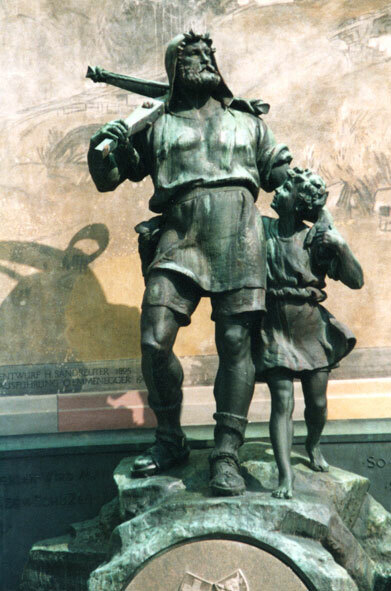 In the 14th century branches of this family immigrated from Tee directly to Ausserberg, their descendents were called «zer Telun» and later Theler. They branched themselves out later to Raron, Eischoll, Visp, Eggerberg and elsewhere which still exist today. From Ausserberg branches immigrated everywhere, to Raron, then Eischoll, to Visp and Eggerberg. Still today, this family in 6 different Orte in Oberwallis possess civil rights. Alone from the fact that Seedorf and the whole of Schächental, around the middle of the 13th century was settled by the Walliser (also referred to as Walser), leads us to look for their ancestors in Wallis. This means, the ancestors of our national hero, Wilhelm Tell originated in the Orte Teel and were therefore Walliser. I used numerous sources to gather this information, here you will find listed the most important ones: Die Archive von Naters, Ausserberg und Sitten. Die Kirchenlade von Spiringen. Die Briger- und Klingenbergerchroniken, das Weisse Buch von Sarnen. Die Anfänge der Schweiz. Eidgenossenschaft von Prof. Dr. W. Oechli. Walser Volkstum v. Paul Zinsli 1970. Rütlibund und Wilhelm Teil von Otto Hunziker, Zürich, 1934. Reinerlös für das Tellmuseum in Bürglen.